St. Marks Painless Dental (Brooklyn) - Book Appointment Online! St. Marks Painless Dental is proud to be the top-of-the-line dental practice. Latest technology and most up-to-date dental protocols, solid academic knowledge, advanced training and years of experience are used to ensure that you maintain healthy gums and teeth for a lifetime! We aim for the most conservative and least invasive approach to treatment planing. Having advansed training in all areas of dentistry allows our doctors to treat patients efficiently and painlessly. We take pride in our quality work, and ensure that all procedures are carried out as carefully and painlessly as you’d like them to be. We believe that even state of the art dentistry should be affordable. We work very hard to run our practice in most efficient way, which gives us an opportunity to offer highly competitive fees for our treatment. We evaluate each case to the smallest details to make sure there will be no surprises and additional charges later on in treatment. Moreover, the goal of our billing department is to structure the billing process to minimize out of pocket expense for our patients. We also offer 12 month interest free payment plans to our patients. We will work with you and your budget to make your dentistry affordable. At. 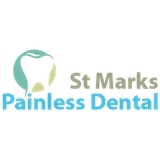 St. Marks Painless dental our relationship with patients doesn’t stop with finishing their treatment. We stand behind our work and want you to enjoy it for many years. A semi-annual checkup and cleaning is strongly suggested for a long-lasting upkeep of your healthy mouth. We believe in well lubricated recall system and we implement it using computer technology to make sure that nobody is left unattended. This visit was very good.